Our clients wanted us to create a family shower room and gave us 100% free rein in which to do so. 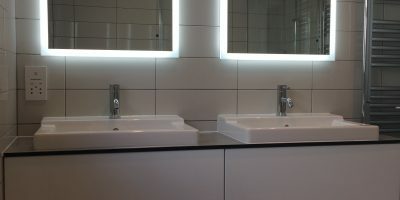 We were given a wish list from which we were able to plan, design and install a beautiful new shower room. At all times the clients were kept informed, samples were produced and signed off, but what was really amazing about this project was that our clients went away for half of the install. 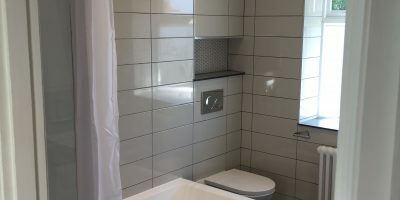 This is testament to the faith our clients have in Jamie Stafford Bathroom's and our team fully understanding and delivering the clients brief. This was a lovely project to do. Our clients new what they wanted and with our help planning their family bathroom we created a lovely room for all the family to use. The shower curtain set up although received with a little bit of hesitance has been a great asset to this room. The porcelain wooden floor tiles are set in a herringbone pattern with underfloor heating. 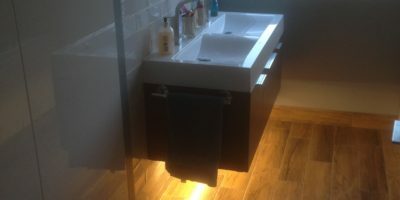 Twin basins on floating furniture creates floor space. Shower alcoves, acrylic work top and window board add something a little different.